Robotic or automatic milking systems (AMS) have steadily increased in popularity in the dairy industry since the installation of the first commercial unit in 1992 in the Netherlands. In 2015, the number of AMS units installed was over 25,000 worldwide. Here in Nebraska, there are two commercial dairy farms that having installed multiple AMS units, Demerath Farms (Plainview, NE) and Beaver’s Dairy (Carleton, NE). Demerath Farms installed four AMS units in February 2017 and are set up to milk 240 cows. Beaver’s Dairy began milking with five AMS units in May 2017 and is set up to milk 300 cows. Additionally, there are several other dairies that are looking into milking robots for their farm. 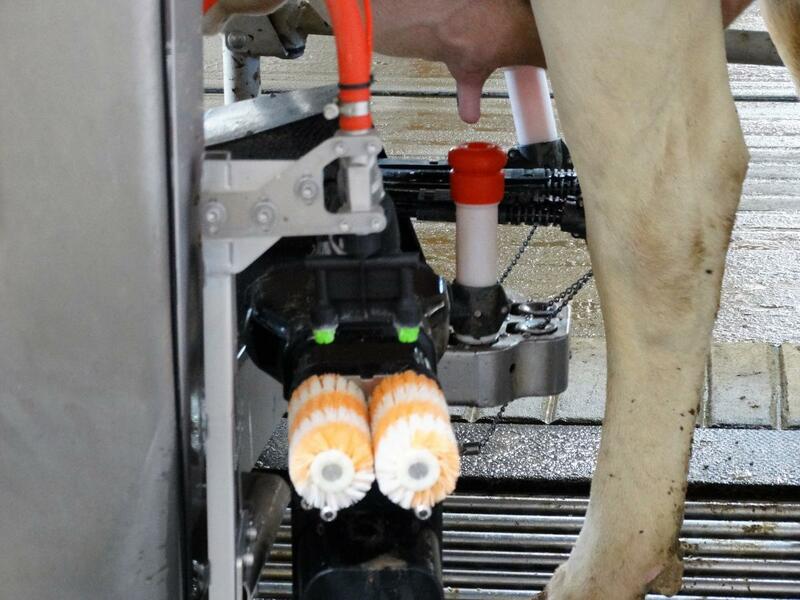 Typically, 60 cows are milked on one robot. One robot will likely cost the producer anywhere from $150,000- $200,000. Robots have been seen as the “new and improved” way to milk cows because they may provide opportunities to decreased the labor pool and allow producers to spend more time on animal care. In a survey of 10 United States dairies and 15 Canadian dairies who had installed an AMS, 70% of the farms reported a decrease in hired labor costs. Some other opportunities that may come with installing an AMS include the system providing information to the producer including individual cow milk production, milking frequency, rumination and movement activity, concentrate intake, health alerts, and much more. This information could in turn, help the producer make more informed herd management decisions. Because cows can be fed a concentrate supplement when visiting the AMS there is also opportunity to feed individual cows closer to their nutrient requirements within their stage of lactation. This could decrease overfeeding nutrients to cows, therefore increasing feed efficiency, milk production, and economic returns. Feeding in the AMS The frequency, timing and amount of feed supplementation is also controlled by the AMS. 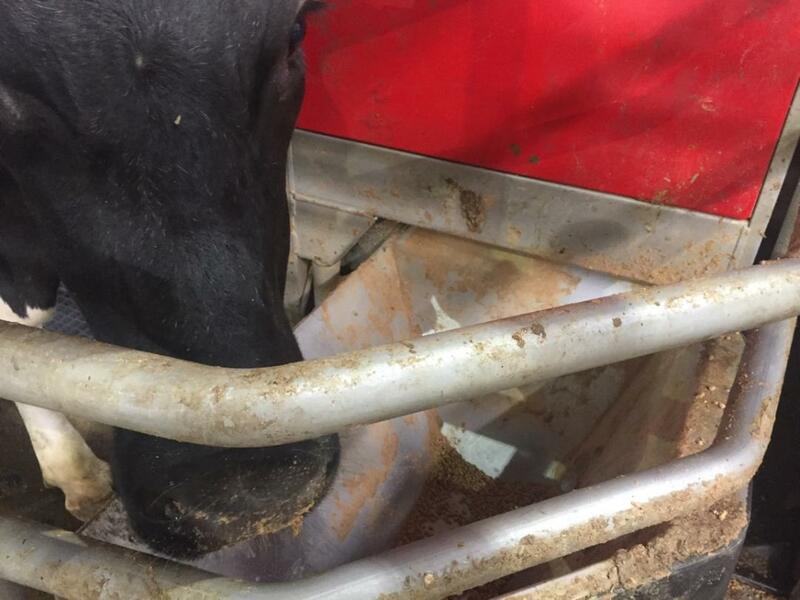 The primary reason for feeding concentrate in the AMS is to entice cattle to enter the AMS. In simple terms, the cow’s biological need to eat is stronger than her biological need to be milked. This feature has stimulated the industry to re-examine overall nutrition strategies. In general, the nutritional goal of any dairy farm is to develop a low cost diet that meets the nutritional requirements of the cow while optimizing milk production and cow health. In a conventional system that is not utilizing an AMS, this goal is typically achieved by offering a consistent total mixed ration that is mixed and delivered at the same time every day. With an AMS system, this system is modified by offering a fraction of the concentrate during milking in the AMS, and the resulting portion of the concentrate along with the forage, and vitamins and minerals are fed in a partial mixed ration at the feedbunk. The need to “fetch” cows Cows not frequently visiting in the AMS must be brought to the units and are commonly referred to as “fetch cows” and represent a big challenge. This is a complex issue which spans animal and environmental factors such as social structure in the herd, farm layout, type of traffic, and health (especially lameness). Uneven milking intervals result when time between milkings is not equal. For example, milking at 6AM and 6PM results in an even milking interval of 12h. Uneven milking intervals can also lead to mastitis, decreased daily milk yield, and lameness. Uneven milking intervals can also lead to decreased economic returns due to the physical labor that is required to go out into the barn and push cows to the milking unit. Solutions for uneven milking frequency included 1) implementing a guided or forced traffic system that will utilize a pre-selection gate to guide the cow to milking and 2) to entice the cow in the AMS with the concentrate that is offered during milking. Managing cow traffic Farms using an AMS are constructed into one of two types of guided traffic systems: the milk first system and the feed first system. In the milk first system, the cow leaves the lying area and passes through a pre-selection gate where she is determined to be eligible for milking or not, eligibility is defined by the producer but is typically set to have cows milked every 6 hours. If the cow is eligible for milking, she will be guided into a commitment pen that contains the AMS where she will stay until she passes through the AMS for milking. If she is not eligible she will pass through the pre-selection gate into the feed bunk area. In comparison, in the feed first system cows start at the feed bunk, passing through the pre-selection gate and ending in the lying area. AMS… what we don’t know There is limited research available on the best methods to entice cattle to the AMS with the concentrate fed at milking; however producer experience has shown cows are enticed with concentrate at the AMS. Some research has been conducted on changing starch content, grain type, and flavoring. Manipulating starch level to entice cattle does not seem to influence milking frequency. However, a concentrate with low starch content (25%) has been shown to increase milk yield in the AMS. In terms of grain type of the pellet, a barley-oat pellet has been reported to decrease the number of cows needed to be fetched to the AMS and increase the number of visits to the AMS when compared to other grains. Interestingly enough, New Zealand researchers have found that for a grazing dairy, the absence of concentrate in the AMS had no negative effects on milking frequency. Finally, flavoring of the concentrate in the AMS has been shown to significantly increase the visits to the pre-selection gate, and increase milking frequency. 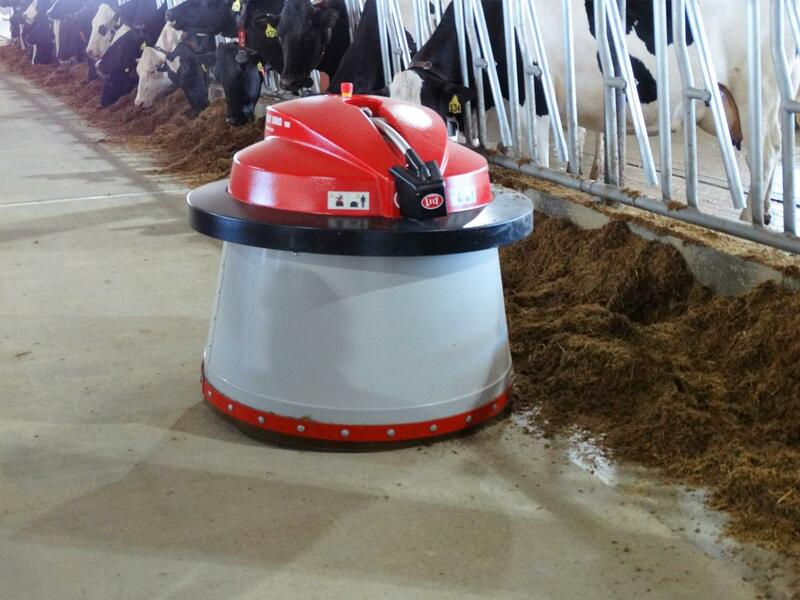 Dairies have been using robots for more than 25 years, and as the research and technology improve, the number of AMS units will continue to increase.